Modular, compact and powerful are the hallmarks of the Alcatel-Lucent 7710 Service Router. Boost your network with robust capabilities and support for a variety of service router operating systems and platforms that emphasize throughput and performance. 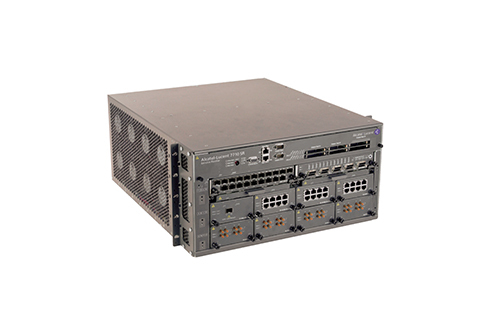 Worldwide Supply provides a variety of refurbished Alcatel-Lucent 7710 SR units that are optimized for your network locations that need a lower throughput to aggregate lower-speed subscribers. It’s a leading multiservice router that can be deployed as a core piece of your transport and mobile backhaul network or support today’s triple-play options. Each used Alcatel-Lucent 7710 SR from us is proven to be reliable and robust thanks to our in-depth review and testing procedures. We’ll help you save on costs but never reduce capability at your distribution hubs or locations with a smaller presence. The Alcatel-Lucent 7710 SR supports a broad range of unicast and multicast routing protocols as well as wire-speed Layer 2, L3 and access control list filtering. The platform can scale as you need it to, supporting more than 1 million routes, 17 million BGP paths, 500 BGP peers and up to 7,000 concurrent customers. Each refurbished Alcatel-Lucent 7710 SR unit comes equipped with a dual IPv4 and IPv6 stack so you can deliver IPv4- and v6-based services simultaneously with no performance loss. Choose a used Alcatel-Lucent 7710 SR from Worldwide Supply for high-quality equipment that maintains reliability and network strength. That way, you don’t need to compete as a commodity for services like business VPN, but instead can focus on being a value-added partner for WAN optimization, QoS and much more.